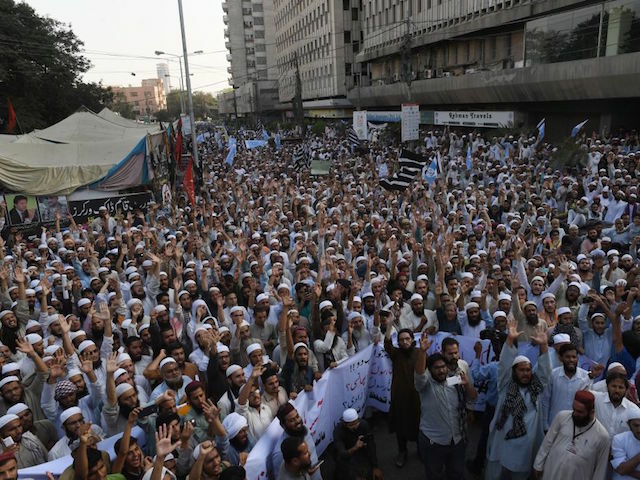 Thousands of Islamist radicals blockaded streets in major cities across Pakistan on Friday, the third day of protesting the acquittal of Christian mother Asia Bibi. This forced the government to shut down mobile phone networks and keep schools closed to protect children. The country’s Supreme Court acquitted Bibi of her death sentence for “blasphemy” on Wednesday, citing a lack of evidence. Bibi reportedly remains in an undisclosed location for her safety. Hardline Islamists, many of them of the radical Tehreek-e-Labaik Party (TLP), are demanding her death, the death of her family, and the death of the justices who acquitted her. Some have also demanded the killing of Prime Minister Imran Khan for urging the mobs to stay home and stop paralyzing the nation. 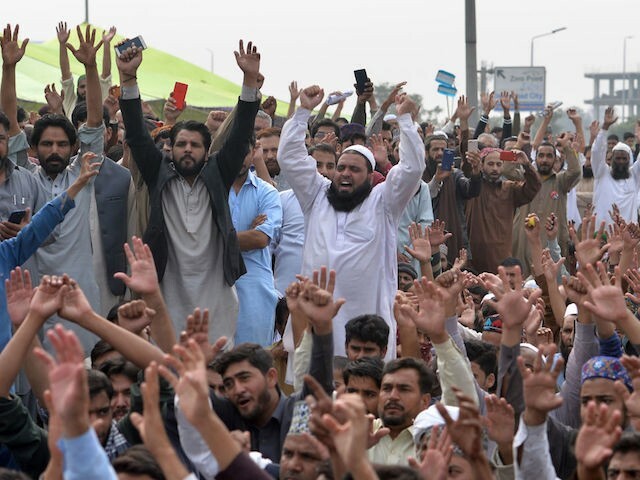 On Friday, Reuters reported that the government had suspended mobile phone networks in at least Lahore and capital Islamabad in an attempt to keep radical Islamist groups from calling more people to join the riots. Reuters confirmed that the government ordered the shutdown, rather than heavy usage slowing the networks to a halt. Reuters also confirmed the government had shut down schools near the most violent crowds. The Pakistani newspaper Dawn later confirmed the mobile shutdown was temporary and phone services had returned to the two cities at press times. Schools, on the other hand, appear to be individually choosing whether or not to open, particularly private schools. Many private school networks have already announced they are not to open Friday or Saturday; some are opening Saturday to make up for closing Friday. Pakistan, in the midst of an educational crisis, is suspected to keep up to 20 million children out of school. Many of the nation’s poor choose to send their children to Islamic schools that teach hardline political Islamism, a better option than no school at all, they argue. Wealthier Pakistanis can avail themselves of private schools, many of which are run by Christian groups, making them a target for protests. 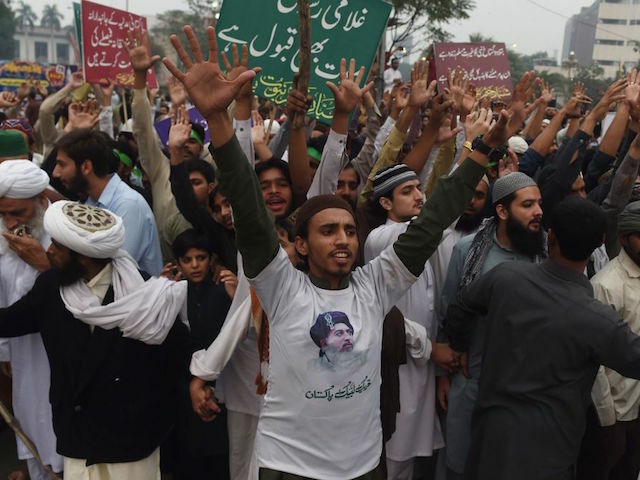 Dawn‘s coverage of the ongoing protests suggests that Asia Bibi has become a catalyst for broader concerns among the radical Islamic groups, which photos show appear to be made up exclusively of men. One of the leaders of the protests, Maulana Fazlur Rehman, told rioters that the reason to fight back against the acquittal was to reject “Western pressure” to defend human rights. Government officials have announced that they are attempting negotiations with the major Islamist groups organizing the protests, attempting to reinstate normalcy in the major cities. Members of the nation’s military have not hesitated to threaten that, without a peaceful resolution to the situation, the military will intervene to end the protests. “The armed forces hope that the matter is resolved without disruption of peace,” Director General Inter-Services Public Relations Major General Asif Ghafoor said in a television interview Friday. “Unfortunately, the army is dragged into every matter.” Ghafoor added that the military was ready to play its “constitutional role” if no other attempts to end the riots succeeded. 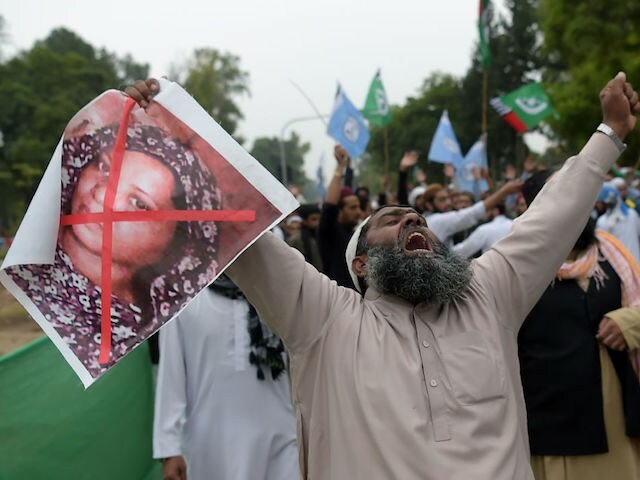 A Pakistani court sentenced Asia Bibi to death by hanging in 2010 after two Muslim co-workers in a fruit field accused her, a Roman Catholic, of drinking water out of a cup meant for Muslims, then allegedly insulting Muhammad. 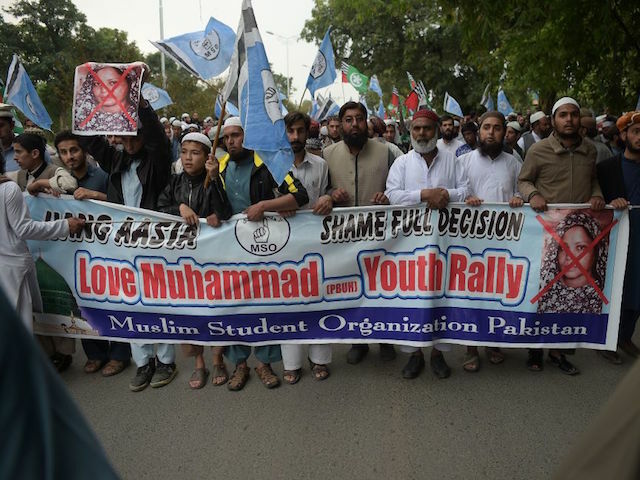 Pakistan’s penal code requires a death penalty for individuals found guilty of disparaging Muhammad in any way. Bibi maintained her innocent, however, and spent eight years on death row and nine in prison. The Supreme Court found insufficient evidence that Bibi committed the crime in question. In its decision and a concurring opinion, the justices argued that not only was Bibi innocent, but that her accusers had committed blasphemy by lying about the charges. Bibi reportedly remains behind bars at press time, both because the court needs to finalize her acquittal and because her life runs grave danger should she be allowed in public without security. Relatives are attempting to file for expedited asylum to flee the country but have been caught in a web of bureaucratic procedures, according to the British Pakistani Christian Association (BPCA).